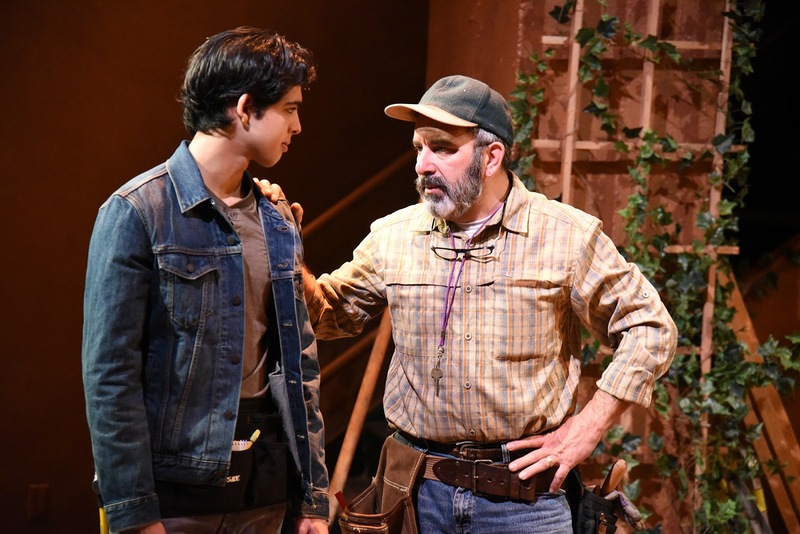 IAMA Theatre Company in association with The Latino Theater Company presents Canyon by Jonathan Caren, a world premier play directed by Whitney White and produced by Patti Anne Miller through March 24, 2019. On this night, an eclectic crowd, young/old, rich/poor, black/white/brown, a.k.a. theatre patrons filled the seats surrounding three quarters of a thrush stage – the deck – an intimate night, dressed in black, and in a passionate setting. Canyon by Jonathan Caren is an impressive work of art that highlights the lives of ordinary compassionate human beings caught in a nightmare of their own creation. How far will human beings go to protect their self-interests? There was something about the two cans of diet root beer that Jake (Adam Shapiro) brought out and placed near the lounge chair on his deck, outside his house, and in his area that struck me as both odd and significant. Notwithstanding the backstory, those two items, quick grabs at a local market, were now what he didn’t want. And, what sane person drinks diet root beer? But, fortunately, progressive as he was, he couldn’t just discard the diet drink. Instead, he offered it to someone less fortunate than he, like the Mexican contractor, just to make a sincere point. But Eduardo (Geoffrey Rivas) had an ice chest with drinks to suit his purpose and an apple to keep him both fed and hydrated. A diet root beer was not for him. Today Eduardo’s helper was off doing other things so Eduardo brought his son, Rodrigo (Luca Oriel), to assist. Rodrigo, soon heading off to college, was not impressed by his father’s situation. And he was rebellious and vocal about how his father was being treated, working for slave wages in order to satisfy the wants of a successful young rich white guy with a beautiful home off a canyon road in Los Angeles. It was 2016 and we were all God’s beautiful creations back then. Still, Eduardo had the work and had to work to pay for Rodrigo’s college. But one extra job was convincing Jake to make up his mind about extending the deck while he hung around doing odds and ends waiting for the ultimate answer and the cold hard cash. Rodrigo couldn’t know all this, spirited as he was looking out for his father’s behalf. Picking up an arrowhead, the father soothes the temporal beast within his son’s being by explaining that they have been here a lot longer. So, Eduardo hangs around Jake’s home in hopes that Jake can convince his wife, Beth (Christine Woods), a physician and breadwinner, that they need an extension on the deck. Of course this is something Jake and Eduardo want to keep to themselves until the deal is done. Meanwhile Beth, in scrubs, arrives home after a hard day. A few months pregnant, she nurtures their home, loves relaxing at home with her husband, and spending time on their beautiful deck. Jake, taking the opportunity of massaging Beth’s feet, has scenic thoughts of expansion. A short time later, Will (Brandon Scott), Jake’s college friend and now public defender and his wife Dahlia (Stefanie Black), arrives from back east. They are an interracial couple and are clearly having problems in their relationship. In the meantime, Dahlia enjoys a brief respite from their two children and immediately sets herself relaxing on the deck with a few glasses of wine as Beth holds the bottle. Later, Will confides to Jake that he wants out of the marriage, that their son has autism, and the tension between them and their unpleasant reflections has them discussing matters with a marriage counselor. But, he’s definite, he wants out. Without getting into details, the secret confessions are released. And those secrets, not whispered in the night, bounce off the canyon walls, and find their mark. The next morning is filled with tension and survival is broken down to its rustic simplicity on the deck. Never ending love suddenly becomes a battle of survival. And then someone gets hurt; bodies are now thrown off the deck and lives roll metaphorically down the steep canyon walls. 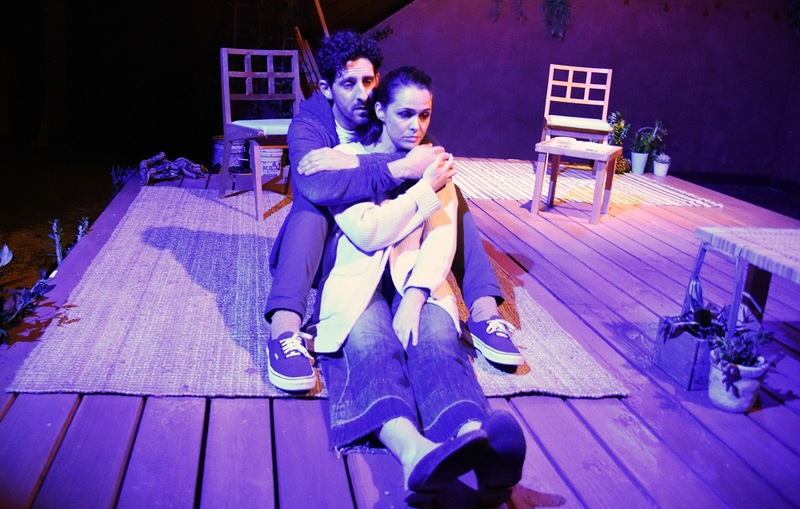 Jonathan Caren has written an exquisite play. His words are masterfully relevant at time before the world turned ugly. (2016) The play is a sincere look at polite and ostensibly progressive human beings who turn when dramatic tensions have them fighting for their own best interest and bitterness usurps the eloquence once prevalent. When tragedy strikes, a torrent of race hating falls like rain. And to that end their unaccountable indifference finally becomes accountable causing unfathomable pain. The suffering is self-inflicted, humans being hypocritical, and the progressiveness seems to be a facade easily crumbled. And one character breaks most of the principles of being a Unitarian Universalists. It ends when forgiveness becomes the only viable option. Whitney White, the director, moves the actors in a way that paying attention is critical. She gives you enough of the relationship to question its authenticity. And then questions your involvement when taking sides in the critical moments. The blame game becomes one of acute observations in this intimate space – almost as if the director has pulled focus away from significant events on and off stage to take the audience for a mental ride. And for those reasons, it is a wonderful achievement and worth seeing again and again. The acting is well above par and it moves along in a fast clip, sometimes too fast as the pain in moments have little time to make their mark. Adam Shapiro is terrific as Jake, a man who is engulfed in his own self sacrifice, giving up his life to live off the sacrifices of others, his dad and his wife. Listening to others and accepting the information is his downfall. But, throughout it all, his action is the saving grace. Shapiro gives a fine performance, natural and nuanced. Christine Woods is Beth, the breadwinner in the family. She, on the outside, is willing to have a stay-at-home husband, but when push comes to shove, she blames her only love for making unwise decisions about their lives. Beth has other underlying issues, dabbing in anti-anxiety drugs while pregnant, discussed but not witnessed. One wished to scrutinize her actions with a little more intensity. She is wearing scrubs but we find out later that she is a physician as if the writer wanted us slightly confused. Woods is very good under the lights. Brandon Scott is Will, a man now in fantods, has succumbed to the pitfalls of married and family life and believes there are better ways. But, the answers to his prayers come at the misfortunes of his friend and maybe that is his way out. Will obviously has other dreams that may not be manifested in Scott’s objective. 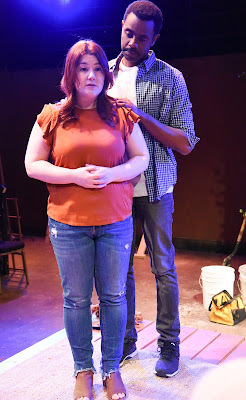 Stefanie Black is Dahlia, a woman who professes to be progressive because she is in a dramatic interracial relationship. She being the more dramatic of the two. Her life is staying at home and taking care of the two children who are getting older. She seems unaware of the pressures of a one-income family and is willing to let her husband carry the burden in his low-paying public defender job. Dahlia is the Pandora’s box letting out one misfortune after another. Black’s work is excellent. Geoffrey Rivas is terrific as Eduardo. He obviously knows what he is doing as the contractor but his actions are slightly ambiguous in the ways he goes about to earn more money. We get bits of information on his life, his drinking problem, and his ways of manipulation. We never see what gets him into trouble or what he does to get his son into more trouble, so during the course of the night, one is suspicious. Luca Oriel is Rodrigo a young man determined to help his father through these tough times no matter what price he has to pay. And maybe he does pay a price near the end as the police come rushing up to the canyon road. Oriel is young and still learning and there is more to add to the performance, still, he has a great look and is very agreeable in the role. Also, the understudies who did not perform the night I attended are: Christine Woods, Aynsley Bubbico, J. Claude Deering, Chris Gardner, Ray Oriel, Alexandra Wright, and Matt Yepez. Run! Run! Run! And take a Unitarian Universalist with you. You’ll have some interesting things to discuss on your deck at home.